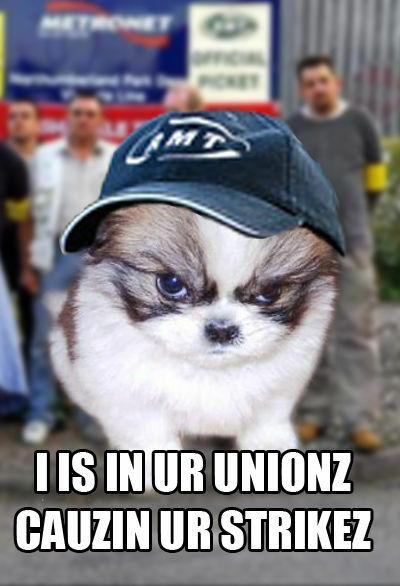 Remember the re-ballot for the strike by RMT members over pay, job cuts & working conditions? Unfortunately for us commuters, the union voted overwhelmingly in favour of industrial action & will be going on strike from 7pm on Tuesday 9th June for 48 hours. Transport for London (TfL) said that instead of engaging in "meaningful talks" about pay the union had submitted "a wildly unrealistic claim". However Bob Crow who also accused the London Underground of failing to stand by an agreement over job security & redundancies, is pleased by the outcome "This is a magnificent result which underlines the anger that has been provoked by management in their confrontational approach on pay and job security. London Underground seems to think that observing agreements is optional, and its plan to cut jobs is simply unacceptable". "The RMT leadership has failed to engage in any meaningful talks on pay, instead submitting a wildly unrealistic claim - demanding a five per cent pay rise for fewer hours in the middle of a recession. "On jobs, the RMT leadership knows full well we are seeking to end the duplication of back office jobs and that no front line staff will be affected. "No responsible union should be asking hard-pressed farepayers and taxpayers to fund jobs that are no longer needed and vastly inflated pay demands." The strike's likely to bring most of the network to a standstill, so unless it's resolved in the meantime, you'll need to come up with alternative travel arrangements on the 9th, 10th & 11th of June. There must be something in the air on the London Underground, last week a woman went into labour on the Central Line, but managed to have her baby in the hospital. Now I've heard through Heather that the first baby boy has been born on the Tube a few days ago. Well not exactly on the Tube as they managed to get the poor woman into the staff room at London Bridge station where she delivered the little chap just after 2pm on Tuesday. Last December, Julia Kowalska became only the second person to have a baby on the Tube after her waters also broke on the Jubilee line. She went into labour on the platform but her baby was born in Kingsbury station. Then there the time 84 years ago when Marie Codery was born at Elephant & Castle Tube station. Although Jerry Springer still contends that he was born in a Tube station. First he said it was East Finchley, but recently on Countdown he said he was wrong and it was at Highgate! Maybe he's just trying to get in on the Tube births limelight, although he's got more than enough claims to fame without needing to add this to his Who's Who entry. No idea yet what the boy at London Bridge is called. Shame it wasn't a girl as she could have been Bridget. TfL have re-started trials of playing classical music on the London Underground in an effort to soothe stressful journeys and ultimately cut crime. However, the canned music doesn't seem to be going down well with residents of Camden Town, who are more used to the Nutty Boys than The Nutcracker. A newspaper vendor poses outside the Tube station with his hands over his ears. Nigel Rodgers who set up a campaign to can canned music called Pipedown, believes the scheme isn't going to work. 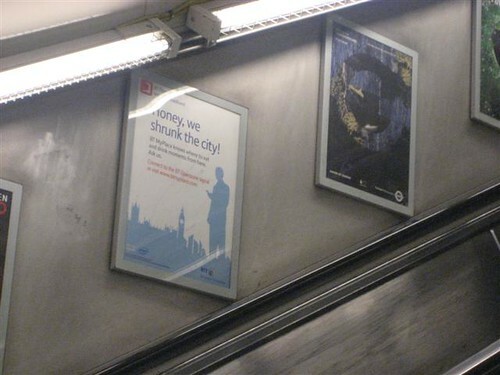 He began the campaign after a similar trial was launched in Piccadilly Circus Tube 15 years ago. He said "Piped music mutilates anything it plays. They play it through a PA system designed for the human voice and it's meant to be acoustic Prozac. Frankly, it always sounds horrible. The answer is to try and fix the many problems with the Underground rather than try and make people numb to them by playing music. It is an abuse of people's freedom to get around without being pacified. What is wrong with having buskers?" 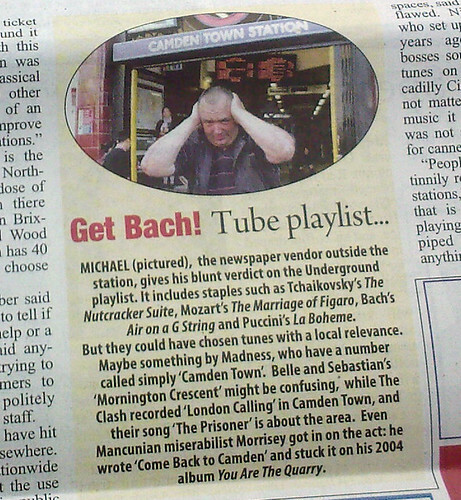 Thanks to Jon Justice, who sent me a picture of Camden New Journal who also aren't wild about the music. They suggest that tunes with more local relevance could have been chosen. Obviously there's Madness's Camden Town. "Belle and Sebastian's 'Mornington Crescent' might be confusing, while The Clash recorded 'London Calling' in Camden Town, and their song 'The Prisoner' is about the area. Even Mancunian miserabilist Morrisey got in on the act: he wrote 'Come Back to Camden'. What do you reckon? Should we have classical music piped through stations to keep us pacified? What about having tunes which match the station or the local? If you managed to get out in the sun & take some pictures this weekend, you might be interested in submitting some photos to an exhibition the London Transport Museum are setting up, called "Show Us Your Suburbia"
"The exhibition on suburbia will tell Londoners stories of the shaping of their city. How transport has influenced the suburbs and continues to do so. It will explore how local identity, lifestyles and architecture come together to form the reality of suburbia." Houses, shops, parks, streets, cars…what does a typical suburban 'postcard' look like to you? We already have an historic collection of postcards of suburbia but we'd like to add yours to it. Show us your suburban garden in all its green fingered glory you could even include the odd gardener or cheeky gnome. Make sure you've got permission from your neighbours if you snap their garden! What does suburbia look like behind your net curtains? Photos can be architectural or domestic, posed or informal. To find out more join the Flickr Group for full details. 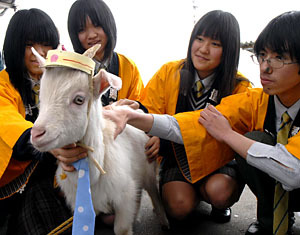 Japanese stations have been trying to get in on the game with their own animals. The Japanese stations also trying to arrange get togethers, perhaps like union meetings where the feline staff from different stations meet to discuss policies. This inaugural meeting didn't go too well. The cats hated eah other. Although one rather strangely is called Bus, even though it is definitely the stationmaster of a railway. Like Jon I'm think we should get our own animals to act as station masters on the Tube. He said: "One wonders where this will all lead. I would like to see it done on the London Underground, but what animals would be best suited? Perhaps we could have a surly, spitting camel for one of the Northern Line stations. Maybe a swan for St James's Park. Blackhorse Road is too obvious. Finchley Road and Frognal is just crying out for an amphibian surely". Any other contenders for animals running Tube stations? Thanks to Utku for spotting a van from London Underground maintenance company, with some rather strategically picked off lettering. 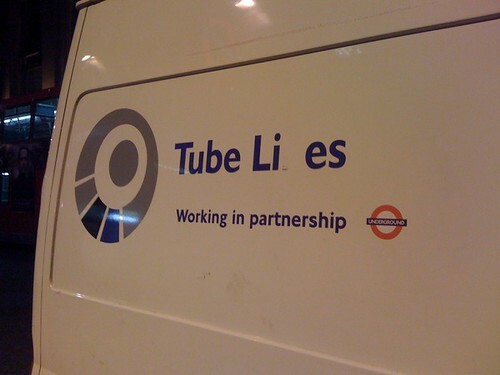 It's going to be hard to think of Tube Lines now without this picture coming to mind. You'll need to make alternative plans from 9pm tonight if you want to use the Victoria Line as RMT members are staging another 24 hour strike. Last month's strike meant the entire line was closed when union members claimed safety features were needed to prevent Tube doors opening on the wrong side. The RMT also believe that union activists are being victimised and are calling for the reinstatement of a sacked driver, Carl Campbell. However, London Underground's Chief Operating Officer Howard Collins says the row is not about safety. "This dispute is about the actions of one RMT member, a Victoria Line driver, who put passenger safety at risk and then compounded his error by failing to follow the correct safety procedures." "This will not be resolved by further strike action, which will only lose RMT members more pay and inconvenience thousands of Londoners, who rightly expect us to uphold safety standards on the Tube." Naturally Bob Crow disputes this and said "We know very well the disruption that the action will cause but we will not sit back while managers play fast and loose with train safety and while our members and activists are subjected to intimidation, bullying and victimisation. "There can be no excuse for the failure to install Correct Door Side Enabling Equipment. It is operational on all other sections of the Underground and this dangerous penny-pinching on the Victoria Line puts both our members and the general public at risk. We've got no option but to strike to force this issue up the agenda and we expect the travelling public will understand that it's better to face up to another day of disruption than to wait for the first fatality." As this is the second dispute, it'll be interesting to see which side will eventually give way on this & Victoria Line commuters might find more strikes on the way. Also don't forget the RMT is currently re-balloting nearly 10,000 members across London Underground and Transport for London for industrial action over separate disputes around jobs, pay & breaches of disciplinary and attendance agreements. Those ballots close on the 28th of May. Some of you may have received an email today from Transport for London announcing the new online departure boards. The mail said "This latest travel tool gives live information about when the next three trains are due to arrive at your selected station. It is accessible through your computer or mobile phone, and can be used before you leave home or work, or whilst on the move, allowing you to plan your journey and save time." I remember when these were tested a number of years ago, when they were only available for a few lines. In principle I quite like the idea (even though they open themselves up to some spoofing). But I'm lucky enough to work only a few minutes walk from my Tube & it's very central station which virtually has a train running every three minutes anyway. However, if you're a longer walk away or at a station that doesn't have the luxury of good information on the departure boards, how helpful are they. Michelle W emailed me and said "When are they going to finally get the stations sorted out though? Since I moved down here nearly 3 years ago I have been commuting mainly between Newbury Park and Debden on the top of the Central line. There has been many new departures boards, none are used though! It would be nice to finally have the boards like the one outside Debden working with useful info instead of just saying eastbound/westbound and being blank. Also it would be nice if they got the new platform ones working as well like at Hainult. You can't read the working old ones unless you're right underneath them because there's a new unused one hung right in front of it that's been blocking it for several years." Do you think we need the physical ones working before TfL start working on virtual ones? It seems a bit ironic to be standing underneath a real platform indicator with nothing on it, yet if you had internet on your mobile phone, you'd be better informed. One of the many urban myths about the London Underground, is that spending 20 minutes down there is the equivalent to smoking a cigarette. I'm not sure how many of you believed it, but it had been quoted in a number of news sources including the Independent, the Standard & the BBC. "The myth originated from work done by Dr Ben Croxford, a researcher at University College London who at the request of a journalist carried out an estimate of the weight of particulate matter inhaled when smoking a cigarette. Croxford subsequently calculated that a person would have to spend 20 minutes in the most polluted part of the London Underground to breathe in the same amount of matter. However, the calculation only made a comparison of the weight of matter breathed in and Croxford’s research never intended to suggest that breathing in Underground dust was as harmful as smoking cigarettes. The subsequent interpretations of this data by the media is a classic example of how lying can be easily achieved with statistics and how scientists must be careful that their data does not mean the lay-reader draws an incorrect conclusion." This made me think about Tube snot myth though, as a number of people have said that if you spend a length of time in the Tube (let's say 25 minutes) & blow your nose on leaving, you get much darker deposits on your hanky. All we need now is another scientist with large box of Kleenex and some willing commuters to put the theory to the test in the bowels of the system. Any volunteers?! 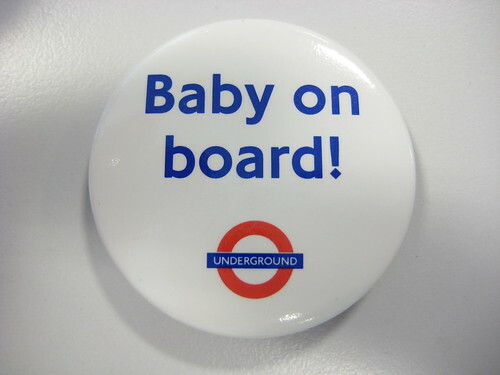 This morning, another woman went into labour on London Underground train and it hit the news. You would think that more women would go into labour on the Tube, but there's only been two births on the Tube (possibly three if you believe that Jerry Springer was born on the Tube). Today's was at 8.34am on the Central Line train at St Paul's Station and staff stayed with the woman until an ambulance arrived to take the mother-to-be to hospital. The train was delayed by about 20 minutes, so I imagine there would have been much tutting from the City workers for the inconvenience. There was an 84 year gap between the last two babies born in a Tube station. Marie Cordery (supposed called Thelma Ursula Beatrice Eleanor) was born at Elephant and Castle station in 1924. 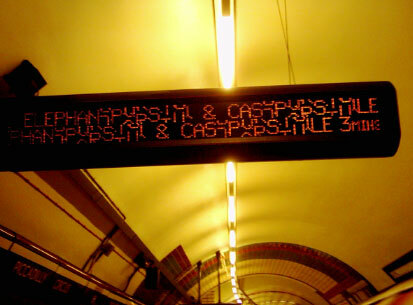 Then in December 2008 a baby girl was born at Kingsbury Tube station. That's not really a lot of Tube births considering the number of pregnant women that must travel on the London Underground each day. So maybe that's why any birth or near birth hits the news. Plus the press are probably itching for the child to be called Theydon Bois or Beckton or some other Tubey name. Maybe the current one will be called Paul or Paula! 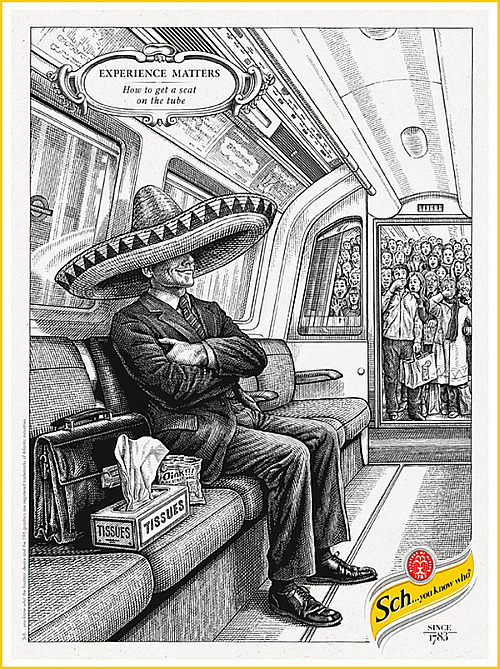 Fantastically topical cartoon from Schweppes on how you might manage to get a seat on the London Underground. I'm not sure if it will actually appear as a real ad or if it will remain in the bowels of the internet as an out-take. But err, hats off to them, for delving into the Swine Flu fear. I actually did see my first suited English looking person on the Tube last week wearing a face mask. I often see people from more far eastern climes wearing masks but I think that's more to do with them having colds and not wanting to spread viruses to other people. However, I'm pleased there hasn't been a mass round of people with face masks on the Tube, specially as I've heard they'll actually do little to prevent the spread of Hamthrax, the Aporkalypse or whatever its new webby name is. The Bay Area Rapid Transit system, otherwise known as San Francisco's BART have taken social networking & Twitter to their hearts. Each week they are scouring Twitter (the micro blogging service where people say what's happening to them) to find out what people are doing while travelling on BART. 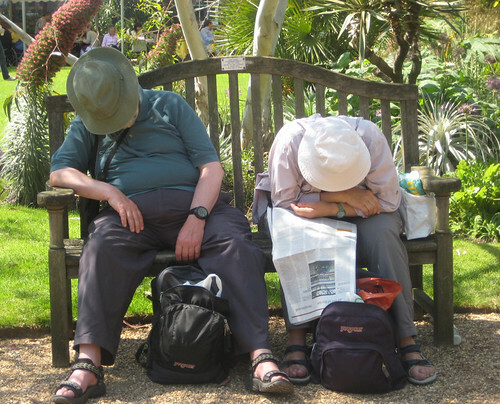 They said "While they're on BART they're gaming, crocheting, listening to music, reading and people-watching." "Old gordon gecko dude missed bart by 30 seconds...and was FURIOUS. We're indoors! Remove your sunglasses!" "Just saw man on Bart with shoes that have toes, no kidding, they are made by vibram? Sorry can't take pic- Then I will look like the crazy 1"
"I wonder if the guy across from me on bart meant to dress like a lumberjack on purpose?" "A lady on BART is watching a horror movie in her laptop with the sound on full blast! She needs to get some headphones." "Why does it always smell so strongly of bacon at my Bart station?" "Today's BART ride smells like... ... ...Like mashed peas and carrots. yes, Baby food." I'm sure someone with more technical ability that me could compile a feed or widgety tool that carries all Tweets featuring the Tube. If anyone fancies doing this, let me know and I'll put in on the blog. Not sure if the London Underground would be brave enough to do it themselves, as I reckon most of our Tube related tweets would be about delays and problems on the lines. BTW if you want to follow me on Twitter I'm here - I can't say I do many Tube related Tweets mainly because I'm underground for half of my journey & can't use my mobile. 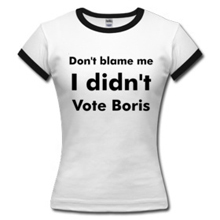 I'm not very handy with a needle & thread, but fortunately a number of people are. Even more fortunate that some geeky craftspeople have an interest in the London Underground too. 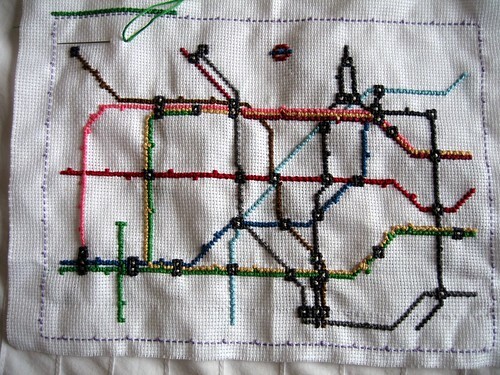 Meg Pickard is making a cross stitch version of the Tube map and has kindly put up some instructions on how to make one yourself. It's not quite finished yet, but is already looking pretty good. If you need to find King's Cross Stitch station, you know where to go. 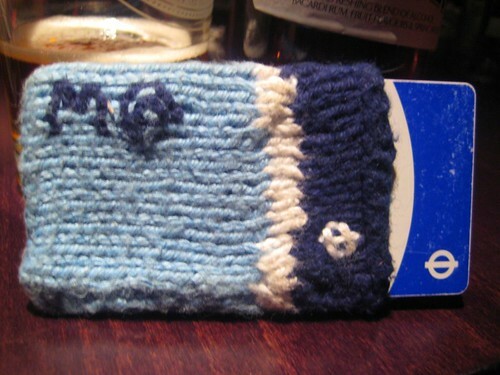 If that's not enough craftiness for you, M@ Brown from the Londonist showed me his brill Oystercard wallet the other day. His wife knitted it for him and it's almost like an iPod sock. I love the initial and the little roundel logo. If you spot any cool & crafty Tube items, let me know & I'll feature them soon. He said "I think it's the first time I've actually seen a sign thanking me for travelling by Underground. Without it sounding like some kind of weird obsession, do you know if this sign as unique as I think it is?" This got me thinking, as I reckon he's right. I can't remember seeing signs that do this. Occasionally, I'll hear the odd announcement on the trains themselves thanking me for travelling by Tube. Admittedly I find that weird as it reminds me of being on a plane and you're thanked for using a certain airline. Often with the Tube many of us haven't got much choice, but to use it - but at the end of the day there is a choice. So perhaps there should be more signs like this which thank us for using it. So is Olly right, are these signs as unusual as he thinks? Also do you know which station he saw the sign in? 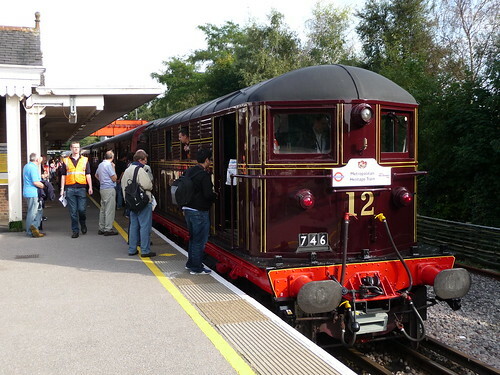 This Sunday 17th May, the oldest working main line electric locomotive in Britain will make special trips between Harrow-on-the-Hill, via Rickmansworth to Amersham. "Engine no. 12 , Sarah Siddons, was built in 1922 and is the last operational Metropolitan Railway electric locomotive; the only surviving working engine out of 20 built by Metropolitan Vickers and named after real or fictitious people associated with the area served by the Metropolitan Railway. The engines had a top speed of 65 miles per hour." said London Transport Museum. Sarah will pull carriages dating back to the 1950s and is making four special trips. Adult tickets cost £20.00 and they're only £3.00 for children. However, the first journey is £25.00 as it travels via Watford and the north curve. Tickets must be booked in advance on 020 7565 7298. Visit www.ltmuseum.co.uk for full journey details & a timetable. There's also a vintage bus service running between Rickmansworth station to the Rickmansworth Festival site at Batchworth Lock. 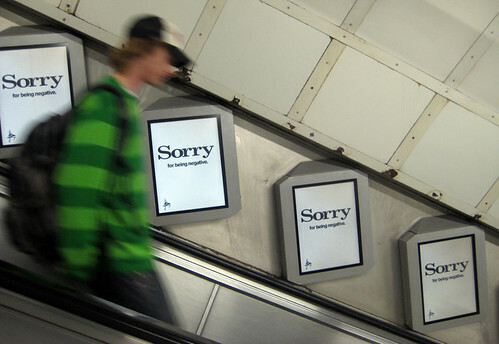 You've probably seen these "Sorry" ads on the London Underground recently. They certainly stand out to commuters by apologising for various things - including negativity, complacency, predictability and taking people for granted. Well, they herald the launch of a new Evening Standard next week. Whether we'll see much change from the paper often called the Evening Substandard remains to be seen, but it's an interesting approach. Wonder if we'll see other advertisers taking a similar approach? 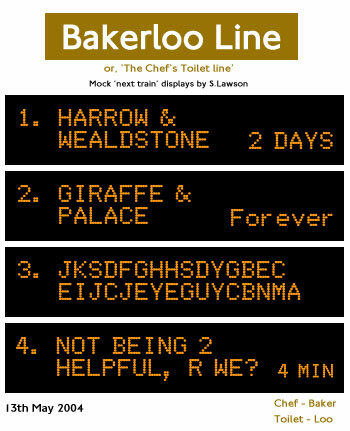 The London Underground itself often has temporary posters up with apologies for delays on certain lines. Perhaps they could take a leaf out of the Standard's book & do a longer term campaign. Sorry for being overcrowded. Sorry for being underfunded. Sorry for being hot. Sorry for being in need of repair. The ads could go on and on! If you've ever wondered what an entire journey on the Northern Line looks like from street level, wonder no more as Ian Buchan has put together a short video. Using Google Street View he charts a trip from Morden to Edgware (via Charing Cross) taking in every London Underground Station. It's a sharper view if you watch in HQ. He's also written a fun song about finding love on the Northern Line to go along with it. 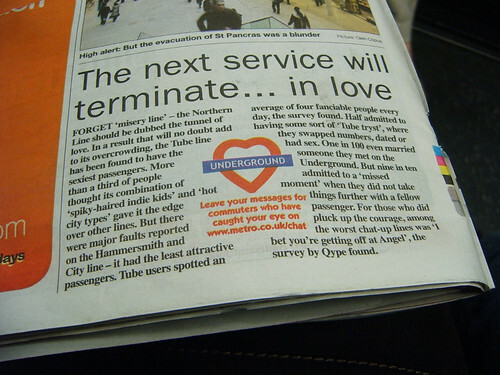 What is it about the Northern Line that's leads people to think it's romantic? Remember the Northern Line love song by Schmoof. Perhaps because it's got the Tube's hottest commuters! Of the overground video Ian said "I think it's the first time anyone's done anything vaguely creative with Google Street View, and I'm really pleased with the results." Thanks to Ianvisits as well who also spotted the video. 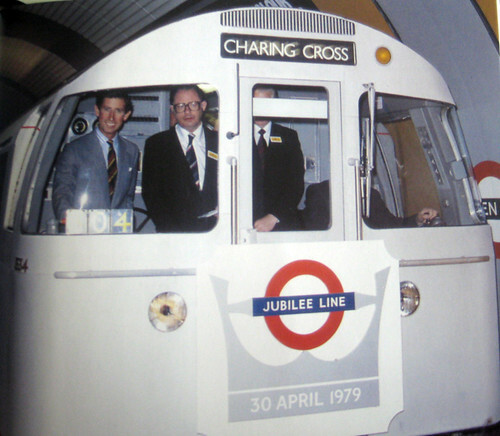 The Jubilee Line was thirty years old on the 1st May. It was officially opened by Prince Charles on the 30th April 1979 - but passengers only travelled on the next day. I'm looking forward for CrossRail to open as it's probably the only other chance we'll get to see a royal standing awkwardly in a Tube carriage. There will be a series of charity fundraising days from the 12th May to mark Jubilee Line turning 30. 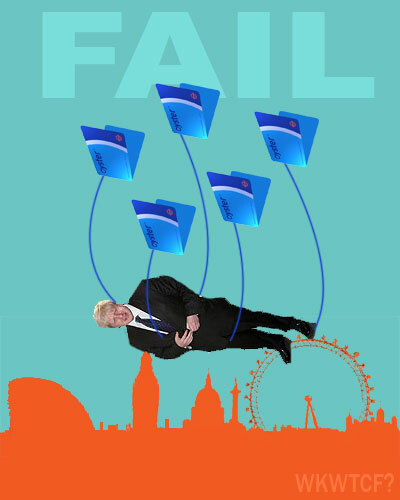 Boris Johnson said "The Jubilee Line and everyone connected to it over the last thirty years deserve plaudits for the huge amount of work they have put in to getting Londoners around our city as quickly and as safely as possible. However it is paramount that during its anniversary year the line receives the massive upgrade that is underway. I appreciate the patience regular passengers have shown as this huge investment takes place. They should be assured that by the end of the year the Jubilee Line will be in a position to offer even better services." So happy were BT MyPlace with number of entries coming from this blog in a competition a while back, the generous people there have decided to give you the chance to win another Aspire netbook. 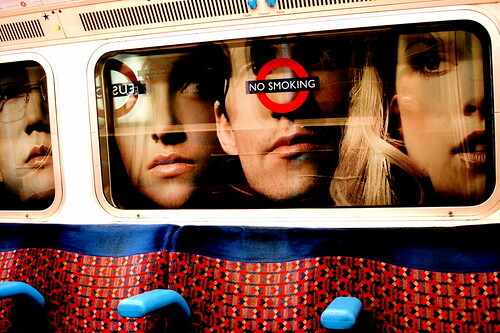 So you may have seen the on the London Underground about shrinking the city. They're all for a new "pocket concierge" service from BT, called BT Myplace. It's a free WiFi enabled directory in Westminster, so if you register your personal preferences (including favourite grub, hobbies, type of shops), you can find nearby recommendations based on those favourites and their location. They want to know your recommendations for the best greasy spoon. Best public loo was also an option, but as there aren't that many on the Tube, I thought you'd be better off suggesting good cafes. All you have to do is register with BT MyPlace, which will take you to the competitions page, click "Enter" next to My Secret Westminster, and follow the instructions to get to the "Best Greasy Spoon" category, give your suggestion and why you believe it's the best. By "Greasy Spoon" they mean best independent cafe, so no chains. Entries must be made before midnight on 7th May 2009, so get in quickly. BT MyPlace will pick the winner and I'll announce who the lucky person is as soon as I know it. The best entries will also be profiled on BT MyPlace.com. Good luck with the competition and congrats to Philip Feriss who was the lucky winner of the last Acer Aspire Netbook & a few other goodies. Lily Allen is going to have a secret London gig on May 11th with a London Underground theme. She said "To give the gig an extra layer of excitement I'm asking fans to dress as London Tube stations - but they won't know exactly where I'll be performing until the day." The Sun made the easy quip & wrote "I wander (sic) what beer-swigging Lily will go as? But I think that's too obvious. When she was in her beehive hairstyle days, she could have gone as High Barnet (although maybe she'll leave that for Amy Winehouse). I wonder what her other musical & celebrity mates will go as? If she's friends with the Beckhams, Mrs Beckham could just go as herself. As could All Saints. Beth Ditto could be Wapping. There's an outfit for Russell Brand if he decided to dress a bit more soberly. The former Mayor could carry some weights and go as a station on the Bakerloo Line. I'm sure the scope is endless. 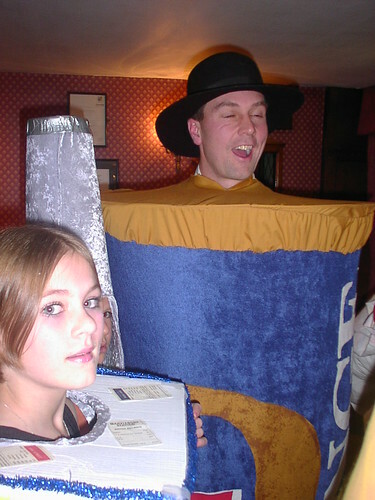 If you have any ideas for costumes or famous people you'd like to see dressed up as appropriate Tube stations, please let us know in the comments.